This project includes more than 65 JOs to replace valves, water lines, and services in various locations in Sun City. Achen-Gardner has responded to 20 emergency water line repairs (2” to 12”) totaling approximately 200 LF of pipe. In each case our crews were on-site with supervision and labor within one hour. Each break was secured and the pipeline was repaired within 8 hours. Pavement and landscaping were restored where needed. 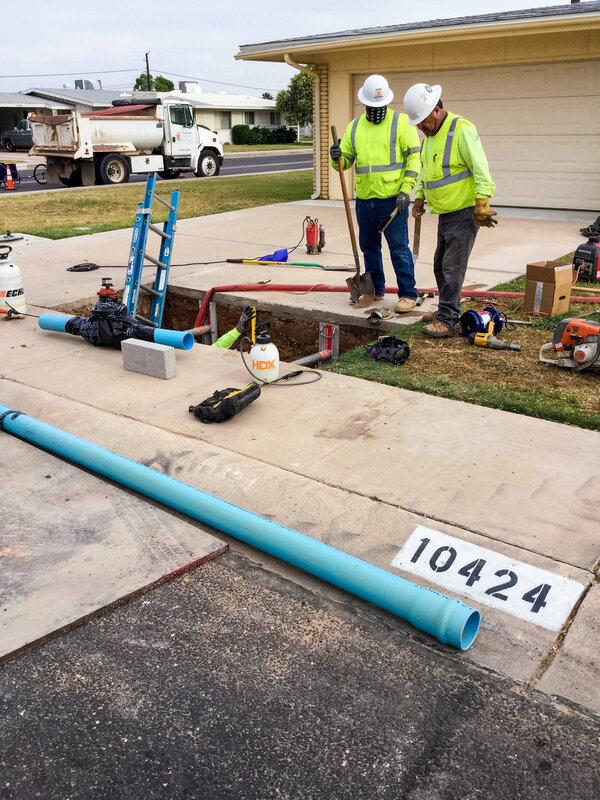 We also completed four small diameter water line repair JOs in congested business and residential areas. Achen-Gardner removed and replaced three broken valves (6” each) in three different locations. In each case, we met on-site with EPCOR's Field Superintendent to a develop the scope of work, pricing, and schedule for repair. We coordinated shutdowns with residents/owners to minimize impacts. Each valve was replaced in less than 8 hours. We also installed 38 new services in a residential area. The existing services were abandoned in place and new services (3/4” to 2”) totaling approximately 800 LF were established with minimal shutdowns.